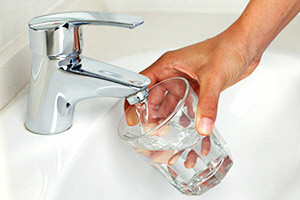 New York State may now have the toughest standards in the nation for drinking water after the state’s Drinking Water Quality Council recommended maximum contaminant levels for toxic chemicals that have been linked to cancer and other health risks. The New York State Drinking Water Quality Council met on Tuesday to discuss maximum contaminant levels (MCLs) for PFOA, PFOS and 1,4-Dioxane, which were found to have contaminated the drinking water in Hoosick Falls, Petersburgh and other communities. The council voted to recommend a MCL of 10 parts per trillion for PFOA and PFOS, as well as a MCL of 1 part per billion for 1,4-Dioxane. The U.S. Environmental Protection Agency’s current health advisory is at 70 parts per trillion for PFOA and PFOS. A MCL of 7 parts per trillion was recommended by the federal Agency for Toxic Substances and Disease Registry in June. This recommendation comes after tireless advocacy by residents who have been impacted by contamination in towns such as Hoosick Falls and Petersburgh. Now that the council has established their MCL recommendations, the Commissioner of Health will consider the recommendations and, ultimately, will be voted on by the Public Health and Health Planning Council. © 2019 Faraci Lange. All rights reserved. Attorney Advertising. Build your own.